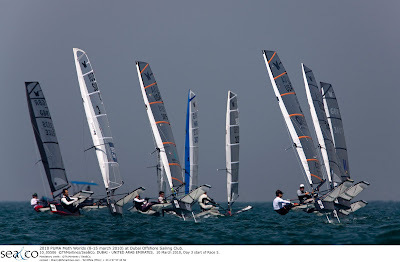 PUMA Moths Worlds fleet on Day 5. Image copyright Th. Martinez/Sea&Co. Just six of a maximum scheduled fifteen races remain in the ultra-competitive PUMA Moth World Championship 2010, and 2006 Moth World Champion Simon Payne (GBR) retains a slim lead over Brad Funk (USA) and Arnaud Psarofaghis (SUI). Light and twitchy breeze only allowed starts for two of the scheduled three races today, the first of which started after a short onshore delay to allow the light sea breeze to stabilize - somewhat. 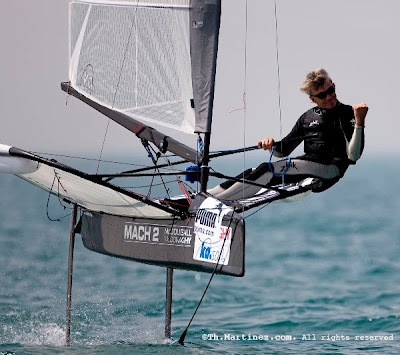 The first race started in 6-7 knots of wind, and Payne won going away over Australian Master Andrew McDougall. European champ Arnaud Psarofaghis continued his run at the top with a third place. Current Moth World Champ Bora Gulari grabbed fourth and Top US Laser sailor Brad Funk crossed in fifth place, his worst finish since day one. "I still feel fast, but I had a lot of trouble getting off the starting line today," said Funk. "But my US team mates gave me some good tips this afternoon on how to power up more quickly and get off the line quicker, and I think tomorrow will be a better day." Psarofaghis led nearly the entire way around the course on the second race, with McDougall using his dominating light-air downwind style to take the bullet after rounding the final mark in third. "I'm in a much better mood today," said McDougall after scoring a 2 and a 1, the best score line on the day. "Last night I did everything I possible could to add power to my sail, as in this wind it is all about grunt, as you saw when I took the lead during the second race by staying up on my foils while everyone else was low-riding." 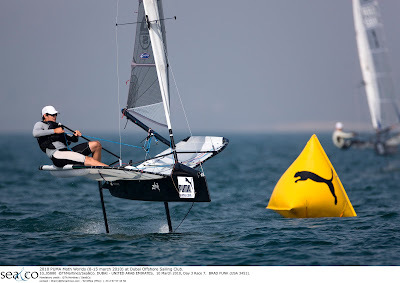 Brad Funk in action on day 5 at the PUMA Moth Worlds. Image copyright Th. Martinez/Sea&Co. Psarofaghis crossed the line in second, and is now tied for second overall with Funk, who duplicated his race 1 performance with a fifth. Payne scored third, displaying his incredible mental toughness by coming back from an over-early call which called him back to the start line. The Championship leader overhauled most of the fleet by the first bottom mark, and held off Michael Lennon (GBR) for the rest of the race, who finished fourth, moving him into eighth overall. World Champion Gulari (USA) finished tenth after a trying downwind run to the finish, giving him control of sixth place and showing the struggle the champ is facing to match the pace of the lighter sailors ahead of him. "Had I realized how light the wind would be here in Dubai, I would have likely trained much differently than I did," said Gulari, "I definitely wouldn't have eaten for the past two months!" Three more races are scheduled for Saturday in predicted conditions similar to Friday's. Hot and sunny with light sea breezes. 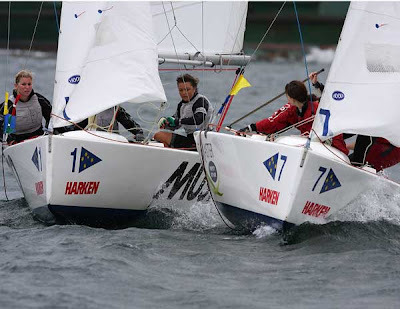 Samantha Osborne in action at Harken Women's International Match Racing Regatta. Image copyright Andrea Francolini. Samantha Osborne, representing Royal New Zealand Yacht Squadron, had a clear goal in her match against Lucinda Whitty – to ruin Whitty’s perfect scorecard in the Harken Women's International Match Racing Regatta. Their match in the final flight of round robin two was a duel with Osborne taking the win by half a boat length. With the sun drenching Sydney Harbour and a moderate sou’easterly breeze, the Race Committee was able to get through the remaining flights of round robin two, conduct the sail-off for the minor placing and complete the first flight of the semi finals. The course was again set in Rushcutters Bay. It was another challenging day for skippers with the shifts in the breeze, but Osborne was happy as she was able to pick them better than the previous day. “I knew everyone would be watching our match today as it was the two highest ranked skippers going head to head. It was good to get the win in such a close match,” Osborne said. 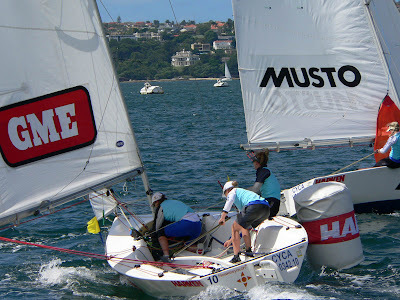 Whitty started the day well, defeating Stephanie Hazard from RNZYS, in her first match. It was her second match of the day where she suffered her first defeat at the hands of Osborne. 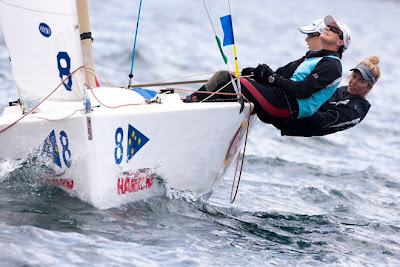 Having finished the round robin on top of the leaderboard, Whitty was able to choose her opponent for the semi final and elected to sail against fellow Australian Women’s Match Racing team member Jessica Eastwell (also representing RPAYC), leaving Osborne to sail off against Olivia Price (CYCA/AWMRT). Eastwell vs. Whitty semi-final. Image copyright CYCA staff. In the Whitty vs. Eastwell semi-final, Eastwell knew that a good start was essential. This was not to be as Eastwell received a pre-start penalty for a port/starboard infringement. “I knew we had to win the start to get ahead of Whitty. After receiving the penalty in the pre-start, we were able to use the shifts up the course to give ourselves enough of a lead to wipe off the penalty,” said Eastwell. “We were then able to maintain this lead throughout the match, beating Whitty by 24 seconds. I am very happy with today’s racing and our crew work is getting better each day – so I am looking forward to what tomorrow has in store,” Eastwell added. Whitty is now even more determined to win the next two flights of her semi-final match up against Eastwell, to move into the Grand Final of the regatta. For Keats Thomson, the youngest skipper of the regatta, aged 15 years, it has been a learning experience against tough competition. 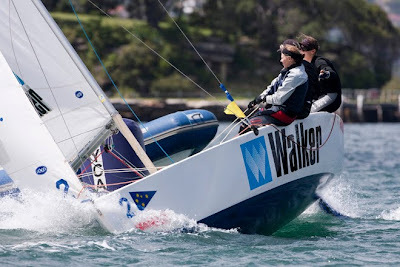 Having sailed in the CYCA’s Youth Sailing Academy Advanced Squad last year, this is only Thomson’s second regatta as a skipper, returning to the Elliott 6.0m and match racing after a successful summer campaign on her Laser 4.7. Note from SailRaceWin: In the first match of the other semi-final Sam Osborne (RNZYS) defeated Olivia Price by 2 seconds in a very close match. JVT: Groupama 3 at the zenith! 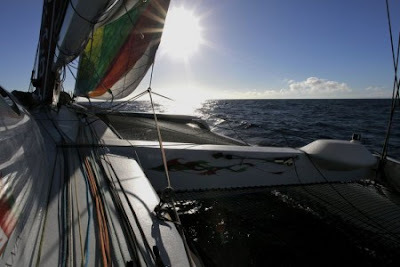 At 15°S, Groupama 3 is 900 miles from the switch of hemispheres, but the sun is at its zenith as the crew approach the boreal spring: the Doldrums, it too stretched across the equator, is already in the sights of navigator Stan Honey and the onshore router Sylvain Mondon. As such the trimaran can now set a direct course for this point at 32°W. The beat finally seems to be at an end! This is certainly the case for the southern hemisphere and probably true of the northern hemisphere... Indeed, there's still a long way to go, the equivalent of that of a Transat Jacques Vabre, which nearly all the crew of Groupama 3 have already competed in over past years. However, in this case, it's from Brazil to Ushant that these 4,250 miles are to be devoured and there are now just ten and a half days in which to do so! In the meantime the pace is gradually picking up and the separation, which has reached 470 miles, is stabilising. All that remains now is to reduce their deficit... This should start to happen this weekend as Orange 2 only made a moderate pace in 2005 on her equatorial passage and took nearly nine and a half days between the switch of hemispheres and her arrival in Brittany. "The weather's good and we're sailing in glorious sunshine: it's perfect weather for staying outdoors! There isn't a lot of wind, not very big seas and no noise... It was so hot last night that I slept on the trampoline up forward because down below, it was bordering on 40°C. I feel more tired than when we were in the Deep South... We're in the process of entering the tradewinds with around fifteen knots of breeze, where we'll be able to make fast headway. Groupama 3 is particularly fond of these conditions. We even sent Loïc Le Mignon up the mast to do a check-up and a spot of DIY on the wind sensors" indicated Lionel Lemonchois at the 1130 UTC radio link-up with Groupama's Race HQ in Paris. The gennaker is scheduled for Saturday with the gradual rotation of the wind from the NE to the E, then the SE. As such the seventeen knot average speed over the past few hours is set to increase once the E'ly tradewinds become more established. Furthermore, the Doldrums at this latitude don't appear to be either overly developed or overly active... Orange 2 took 40d 19h 05' to reach the equator in 2005: it is now an established fact that Groupama 3 will be a day (plus or minus a few hours) behind the reference time when they switch hemispheres. "We're still concentrated and relaxed: there's no reason to be tense because we're still a long way from the finish and the weather may be favourable for us at the end of the course. The die have not yet been cast: we've got a lot to do! The current conditions are very good for Groupama 3, which is lighter and carrying a lot of sail area: the boat is pleasant in relation to Orange 2 which found it difficult in the light airs, as much in terms of heading as speed... I recall a hard day in 2005 during a Brazilian transition". Aboard Groupama 3, three crew are preparing for the next Route du Rhum: Franck Cammas and Thomas Coville in the maxi-multihull category, and Lionel Lemonchois on a fifty foot trimaran. "We should cross the equator around 30°W: we're now going dead straight and have our fingers crossed that we can carve out a very direct trajectory towards Ushant. We could even head to the East of the Azores! This round the world, aside from a large chunk in the Indian Ocean, hasn't really favoured the boat. If we'd had the conditions that Orange 2 enjoyed, we'd be at least four days ahead! For now we're keeping our minds busy with projects after the finish... Along with Thomas and Franck, we're already spending a bit of time discussing the next Route du Rhum!" Danielle Bowater (Boat 1, RNZYS) vs Josie Roper (CYCA, Boat 1) in Flight 8, Round Robin 1, Harken Women's International Match Racing Regatta. Image copyright Howard Wright/Image Professional Photography. A beautifiul sunny day on the harbour with sou'easterly breezes of 12 knots. Racing is in the vicinity of Rushcutters Bay. A short AP whilst the draw for the semi-finals is completed. It is PRO Denis Thompson's intention to conduct the sail off for minor placings and one flight of the semi finals with Flight 2 of the sail-off. Faced with forecasts of strong south-westerly winds, organizers cancelled Day Four Louis Vuitton Trophy racing in Auckland on Friday. The decision was made on Thursday night. In the Viaduct Basin, flags and banners for the Auckland International Boat Show snapped and fluttered in the gusty early morning breeze as exhibitors checked the security of their signs, displays and tents. Winds were expected to increase in the afternoon. Friday’s forecast called for winds ranging from 20-30 knots. Principal Race Officer Peter 'Luigi' Reggio said it was important to protect the equipment and the crews from their competitive instincts. "When we start getting wind that's steady above about 20-22 knots, that's getting pretty windy for this event,” Reggio said. “Remember we only have two race boats [plus a spare] here, so if we get significant damage the regatta is in trouble. "But we're happy to race in winds approaching the higher end. Yesterday we had some gusts near 25 knots at times and the racing was spectacular. Hopefully we'll have more of that over the next few days." Weatherman Roger 'Clouds' Badham advised that the sou’westers are here to stay – meaning robust winds on the Waitemata Harbour for the rest of the Louis Vuitton Trophy regatta. “It’s a good forecast for the next seven days at least, with breezes between 10 and 20 knots in the big meteorological picture," he said. Racing for Saturday is looking positive, with a soft breeze in the morning, picking up as the day goes on – to 15 knots early afternoon, then 20 later in the day. The forecast is good news for spectators, with the courses likely to be inside the Waitemata Harbour – making perfect viewing from the land, the huge natural grandstand of North Head and along the city’s waterfront. 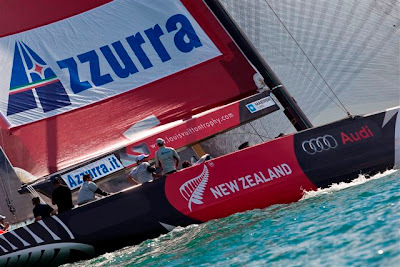 The pairings for Saturday are: All4One (NZL92) vs. Emirates Team New Zealand (NZL84); TEAMORIGIN (NZL92) vs. ALEPH (NZL84); Azzurra (NZL92) vs. Artemis (NZL84); Mascalzone Latino Audi (NZL92) vs. Synergy (NZL84). TEAMORIGIN crew with their new TP52. Image copyright Ian Roman/TEAMORIGIN. Activity throughout the TP52 fleet has been building up progressively over recent months. Small changes to the TP52 Class Box Rule mean that all of the teams which plan to compete at this season’s five Audi MedCup Circuit regattas or the TP52 World Championships in October are required to have made the prescribed modifications to their existing boats: adding 150kgs of weight to the keel to compensate for the reduction in crew weight, moving to a ‘square-top’ mainsail with twin backstays and increasing spinnaker area and adopting bowsprits. 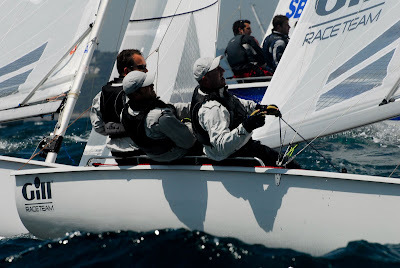 The Circuit organisers World Sailing Management, a division of Grupo Santa Monica Sports, are expecting to welcome the same number as 2009, or perhaps one more TP52 to the arena this season. Two new America’s Cup teams are well into their preparations. 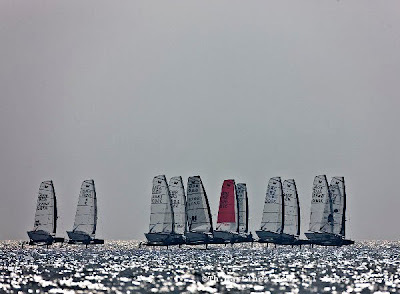 “We expect 10 to 13 boats in the TP52 class and five or six in the GP42 class, all in all a good line up considering the economic climate.” Comments World Sailing Management’s Nacho Postigo (ESP), Audi MedCup Circuit's Technical Director. Great Britain’s TeamOrigin have their new Juan Kouyoumdjian (ARG) designed boat nearing completion at Salthouse Boats in Auckland. Theirs is the only new build TP52 this winter and they are due to ship the boat directly to Portugal. Mike Sanderson (NZL), CEO of TeamOrigin said: “The schedule was always going to be tight but we are on time. The boat is due to leave New Zealand in the middle of March. Emirates Team New Zealand's TP52. Image copyright Chris Cameron/ETNZ. 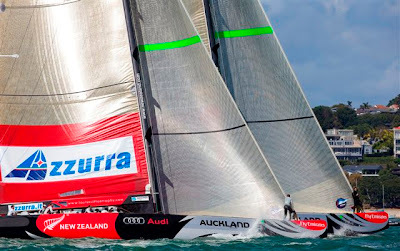 Current Audi MedCup champions Emirates Team New Zealand (NZL) completed their modifications in-house and have been trial sailing the new configuration on the waters off Auckland in excellent conditions. Otherwise, explains CEO Grant Dalton, the only change to their winning set up is the new paint job. They will sail with exactly the same core sailing team, with the exception of the reduced crew number. 2008 Audi MedCup champions Quantum Racing (USA) who finished overall runners-up are believed to have taken the opportunity to update their deck profile and have made a bigger winter refit. Torbjorn Tornqvist’s (SWE) 2007 champions Artemis (SWE), third overall in 2009 have a busy sailing season planned and will be back to challenge hard. Alberto Roemmers’ (ARG) team of Matador (ARG) start training on March 19th as a build up to the Palma Vela regatta, where up to five teams will race including Artemis, Cristabella (GBR) Matador and Synergy (RUS) are expected to take part. Spain’s Palma based Bribón (ESP) has undergone some minor modifications along with the class rule modifications. They have changed to tiller steering, removing the twin wheels, changed the mainsheet system and extended the deckline to the vertical at the back of the boat, in line with all the other newer TP52’s. They will sail with an almost all Spanish crew with helm Gonzalo Araujo (ESP) taking on the role he completed so well at the TP52 World Championships in Palma last year. Great Britain’s double Olympic silver medallist Ian Walker (GBR) will serve as tactician. Also based out of Palma is John Cook’s British flagged Cristabella which has a new rig and will have some crew changes with round the world Racing winning bowman Justin Slattery (IRL) joining at the sharp end, and round the world and America’s Cup navigator Simon ‘SiFi’ Fisher (GBR) joining the team again. Home hopes for the opening regatta will be with Pedro Mendonça’s Bigamist who have been winter training hard off their native Cascais. Their prolonged training together was the foundations for a very successful 2009, and so on their own local waters, the Portuguese team have a good chance of starting the 2010 Audi MedCup season on a high note. The GP42 fleet is taking shape presently with at least one boat which is new to the Circuit, stepping up after enjoying their participation at the 2009 GP42 World Championships. The new season starting in two months will not just add new teams, rules and venues, but a new effort in popularising both the Audi MedCup Circuit and the sport of sailing. Fernando Iñigo (ESP), Audi MedCup Circuit and World Sailing Management Marketing Director, explains: "We are working on consolidating the TV successes we achieved in 2009, including important innovations that we will reveal soon which will revolutionise the way we communicate the sport of sailing. Apart from that, we are designing a new and more ambitious public area in order to keep on evolving our goal of making the Audi MedCup Circuit more popular. "In that sense, the two new venues, Barcelona and Cascais, are key". Price (AUS) vs Osborne (NZL) setting spinnakers, flight 4, Harken Women's International Match Racing Regatta. Image copyright Andrea Francolini. Lucinda Whitty has maintained her unbeaten record in the Harken Women’s International Match Racing regatta with another perfect scorecard of 7 wins, giving her an overall total of 16 wins with two flights of Round Robins still to be completed tomorrow. In strong southerly conditions crews had to sail faultlessly to achieve wins. The skippers who had the best boat handling skills and who could pick the gusts gained the advantage in the tricky conditions. “The scorecard will be wiped clean when we get to the semi finals at the end of tomorrow and the competition is getting tougher every day,” added Whitty. Lucinda Whitty, day 2 Harken Women's International Match Racing Regatta. Image copyright Andrea Francolini. First place cannot be taken away from Whitty, who will get to select her semi-final opponent from a group of four skippers currently fighting it out for the remaining three finals berths. Olivia Price and her crew of Amanda Scrivenor and Angela Farrell, representing the Cruising Yacht Club of Australia, the host club, and the Australian Women’s Match Racing Team, came away from today with 6 wins and only one loss to the leader Whitty. “There were some really tough matches today with our best match up against Stephanie Hazard from RNZYS in the second last flight of the day. We were always pushing it right to the edge of the race course, trying to maintain the upwind position throughout the course,” said Price. “It was good gybing and luffing conditions and we were able to get some good gains but also some losses. Part of our success today was the good support we had from our cheer squad that was made up of combined family members,” added Price. Samantha Osborne representing Royal New Zealand Yacht Squadron came away with 5 wins and 2 losses for the day, with her first match up of the day resulting in a loss to fellow club member Stephanie Hazard. Jessica Eastwell (RPAYC) also came away with 5 wins and two losses today, securing her fourth position with Stephanie Hazard in fifth just one point behind. “I am pretty happy with my performance in the regatta so far, having returning to helming after a six year break.” Eastwell has not had a six year break from match racing, rather is part of the Australian Women’s Match Racing team and usually rotates between mainsheet and bow. As part of their training regime the AWMRT members are rotated through the different crew positions. Kim Stuart, representing Women’s Sailing Association of Santa Monica Bay, USA had an exciting day two, picking up her first two wins in the regatta. In summing up the day’s racing PRO Denis Thompson said that in the shifty and puffy conditions the umpires and race committee had a testing day with such highly competitive match racing on display. Olivia Price and crew hiking on Day 2 Harken Women's International match Racing. Image copyright Andrea Francolini. The remaining flights of round robin two, together with the sail-offs for minor placings will be conducted tomorrow Friday 12 March with racing commending at 1015hrs. The Bureau of Meteorology predicting a slightly lighter air day with SE winds of 10 to 15 knots. The event will conclude on Saturday 13 March when the finals will be conducted. 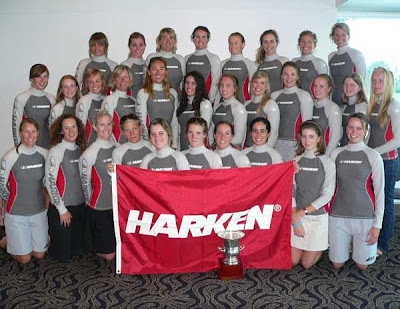 Teams competing in the Harken Women's International Match Racing Regatta at the welcoming ceremony. Image copyright CYCA staff. Lucinda Whitty and Samantha Osborne are locked in a trans-Tasman battle at the top of the leader board at the end of round robin one in the Harken Women’s International Match Racing Regatta, being hosted by the Cruising Yacht Club of Australia. Osborne and Whitty were tied for first place with eight wins to their scorecards until the final flight of the day when the skippers faced each other. Whitty triumphed taking the win in tight match racing conditions to take an unbeaten record of nine straight wins into day two. Second placed Osborne's only loss of the day was to Whitty, and Osborne is keen to attain for this loss on day two. “The last match of the day was really tight between us. It was only our boat handling skills that let us down on the last leg,” said Osborne. “It was great to get a full round robin in today, so I thank the Race Committee for their efficient management of the regatta thus far,” concluded Osborne. The trans-Tasman rivalry was evident at this morning’s briefing with the Aussies quick to blame the Kiwis for bringing the rain with them. Under cloudy skies, the wind filled in from the south at 15-20 knots as predicted and hung in all day. The shifty and puffy conditions meant that teams were crossing over between match racing and sailing the wind shifts. 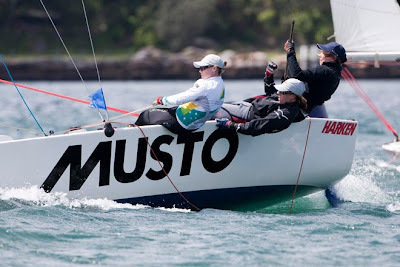 Whitty’s fellow Australian Women’s Match Racing team members Olivia Price (also representing the CYCA) and Jessica Eastwell (RPAYC) are currently tied for third, with 6 wins and 3 losses each. “Our toughest matches were against Osborne and Whitty and we threw everything we had at them,” concluded Price. Stephanie Hazard and Danielle Bowater sailed extremely well and have finished round robin one with five wins each. Both representing the Royal New Zealand Yacht Squadron, Hazard and Bowater cannot be ruled out for podium positions given the expected conditions tomorrow. 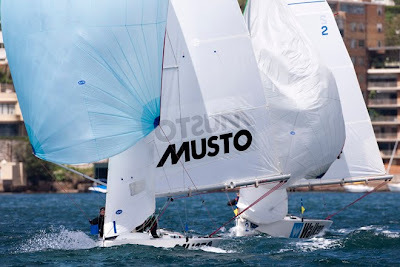 Racing continues tomorrow Thursday 11 March at 1015hrs, in the vicinity of Rushcutters Bay, with the Bureau of Meteorology predicting S/SE winds of 15 to 20 knots. The event will conclude on Saturday 13 March when the finals will be conducted. Franck Cammas and his nine crew are navigating through a difficult zone between a stormy low and the tradewinds of the Saint Helena High. In fact Groupama 3 will have to continue northward for another 36 hours before she can escape this meteorological minefield and pick up the thread of this Jules Verne Trophy again... Each puff of breeze translates as a gain or loss in relation to the reference time! "We had some difficulties last night and since then we've had to deal with squalls every ten minutes, but we're now beginning to escape this unstable zone! We're not yet into the tradewinds, but it's reminiscent of such conditions, even though we're not yet reaching great speeds. Everyone is on watch in the rather pleasant conditions in order to build up their strength again. After 39 days at sea, we're no longer having any problems in adapting to the weather conditions, but we have lost some weight and we're longing to eat fresh food!" indicated Franck Cammas at the 1130 UTC radio link-up with Groupama's Race HQ in Paris, in the presence of Frédéric Courant, co-host of a French science programme. The unstable zone of wind isn't yet astern of Groupama 3 as they must not only leave behind them the stormy low, which has dramatically slowed their progress over the past two days, but also traverse a ridge of high pressure, which will be a tricky transition phase taking them on to the E'ly tradewinds of Saint Helena... For now then, the crew is constantly having to adapt with these changeable conditions! "In the space of a minute we were able to have a wash in a squall! However, we're trying to avoid being under the influence of a cumulonimbus where there isn't a lot of wind... We can clearly see that the tradewinds aren't far off now. We've pretty much had it with upwind sailing as the time goes slowly in these kinds of conditions. However, we're going to have to be patient for another 36 hours before we find ourselves in a steadier and more favourable system. The passage of the equator is set for Sunday morning and in the meantime we're going to flirt with the light airs. We're going to have to make as rapid headway as we can to hold onto our chances of beating the Jules Verne Trophy record." "Groupama 3 has been sailing into the wind since Cape Horn and they're going to have to wait till Friday night or early on Saturday before they track down more favourable winds... As such the next 36 hours will continue to be difficult, as they'll have to traverse a ridge of high pressure. After the Doldrums, the NE'ly tradewinds are well installed in the North Atlantic and, following on from that, a depression will need to be created over the North American continent so as to propel the giant trimaran towards Ushant at high speed. There's a strong likelihood of this happening too!" explained Sylvain Mondon from Météo France. In the meantime, the giant trimaran is still managing to maintain a stable separation in relation to the reference time as Orange 2 didn't have the wind gods on her side at this point in 2005 either. Whilst Groupama 3 is having to put in a series of tacks to make northing, her predecessor had to wait a while before they made it through to the tradewinds associated with the Saint Helena High. Currently with a deficit of around 300 miles, Franck Cammas and his men still have everything to play for as the ascent of the North Atlantic wasn't very fast for Bruno Peyron and his crew... However, now more than ever before, every hour counts. Gill Marine racing on the Solent. Supplied image. Cowes Week Limited is delighted to announce a new partnership with Gill, the technical sailing clothing specialists, who have become the official technical clothing sponsor of one of the world’s best-known sailing regattas for the next 3 years. As part of its investment, Gill will be developing a merchandise range with Cowes Week organisers, running a series of competitions to win exclusive prizes, introducing a voucher scheme for daily winners at Cowes Week, as well as providing the regatta team with clothing. Aleph vs. Mascalzone Latino Audi Team on Day 3. 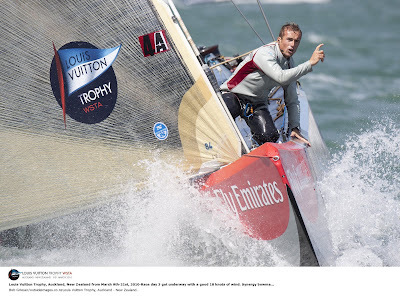 Image copyright Paul Todd/www.outsideimages.co.nz/Louis Vuitton Trophy. Pink flag and first victory for Mascalzone Latino Audi Team in the Louis Vuitton Trophy of Auckland. Little Mila was born last night, daughter of strategist Cameron Dunn, and she quickly became the new mascot of the team, evidenced by the pink flag aboard. After two days where the optimal efforts of the crew failed to produce any points, the ice was finally broken in the third match, against the French of Aleph. 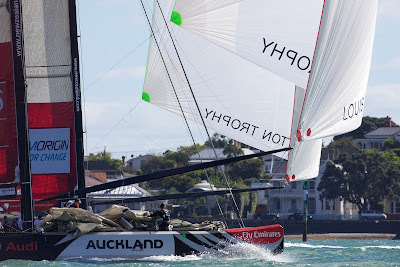 It was a day of brisk wind in the Waitemata Bay with the skyline of Auckland as the background for the races and a large spectator audience both at shore and at sea. In the prestart Bertrand Pace, skipper of Aleph, didn't want to risk getting too close to Gavin Brady, but managed to achieve an even start with Mascalzone Latino Audi Team. Great work by the Italian afterguard, with strategist Flavio Favini and tactician Morgan Larson, who were able to get close to the French boat on leeward, putting her in dirty air and gaining the lead just before the first windward mark. From here, Mascalzone Latino worked perfectly the wind shifts, increasing their advantage to 55 seconds at the finish. A clear victory in the first day of strong wind, up to 20 knots, which saw the group skillfully manage the enormous power an ACC yacht. Thursday's other races saw victories for ETNZ over Team Origin, All4One over Azzurra, and Artemis over Synergy. 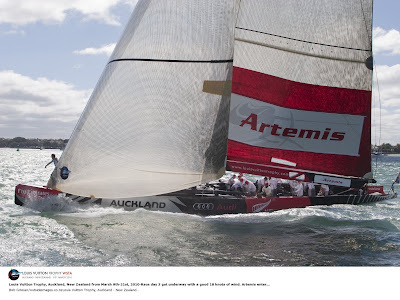 Artemis on Day 3 off Auckland. Image copyright Bob Grieser/outsideimages.co.nz/Louis Vuitton Trophy. A Southerly weather change is approaching Auckland so the winds were backing from the West to the South and have strengthened significantly. We finished up as with last match of the day in 18-20 knots of wind from the Southwest. We got another win today, this time off Synergy, the Russian team. It was a tough fight, so good training for the future. In the first match of the day, Origin had the better of Emirates Team New Zealand on the first windward leg and around the top mark. On the first run, the Brits had a problem getting their jib hoisted and this allowed the Kiwis to take over the lead and the race. This is the second time in a row that the Kiwis have had a bit of luck on their side. Mascalzone Latino Audi Team got a win today from the French team Aleph and ALL4ONE beat Azzurra to hand them their first loss. Boat handling was a feature in many of the races today. Friday's forecast is for more wind, so we may have to hold on the dock. This early in the series the priority is to keep the equipment intact. Azzurra on Day 3 off Auckland. Image copyright Stefano Gattini/Azzurra. Windy conditions today for the third match of the series for Azzurra, the Italian team of the Yacht Club Costa Smeralda that suffered its first defeat in the Louis Vuitton Trophy Auckland. Azzurra lost to the French/German team All4One in a thrilling match held with a strong breeze of 20 knots. This is a small step back for the Italians but also an incentive to grow and move forward. Francesco Bruni, helmsman of Azzurra aided by Tommaso Chieffi calling tactics, today faced an impressive line-up of sailors on board All4One led by celebrated skipper Jochen Schumann from Germany, who has two America’s Cup wins , three Olympic golds and one silver to his credit. The tactics are entrusted to New Zealander John Cutler who has great local knowledge and boasts five America’s Cup campaigns and one Olympic bronze in his resume; match race veteran Sebastien Col is at the helm. The 18th man on Azzurra today was a keen New Zealander sailor, Terry Wells, who won this fantastic opportunity at a competition sponsored by one of the most renowned Auckland restaurants, situated in the heart of the Louis Vuitton Trophy Village. The position of 18th man, which is highly coveted, is usually given out to VIPs, sponsors, celebrities and journalists. A spot in the finals of the Louis Vuitton Trophy will be reserved for the winner of the “Louis Vuitton Junior Trophy Regatta for Young Sailors” that took off today and attracts all the strongest young sailors from the clubs around Auckland. In the other matches of the day, the local favourite Emirates Team New Zealand conquered their third consecutive win, confirming their strength and skill in these challenging races on America’s Cup class boats. Dean Barker and his crew defeated the British of Team Origin that had to retire from the match after breaking the spinnaker pole. The other Italian team, Mascalzone Latino Audi Team helmed by New Zealander Gavin Brady, gained its first point against the French of Aleph. The Swedes of Artemis defeated the Russians of Synergy led by Polish skipper Karol Jablonski. Azzurra and ALL4ONE racing on Day 3. Image copyright Stefano Gattini/Azzurra. Friday Azzurra will face Artemis, the team led by American skipper Paul Cayard who has seven world titles, five America’s Cup campaigns, two round the world races and two Olympics to his credit. Cayard has a very experienced crew with many sailors from the America’s Cup, Volvo Ocean Race and match racing arenas, including Terry Hutchinson from the US as helmsman and New Zealander Cameron Appleton as navigator. The forecast for tomorrow calls for 10-15 knots of wind, increasing to 25 knots in the afternoon. 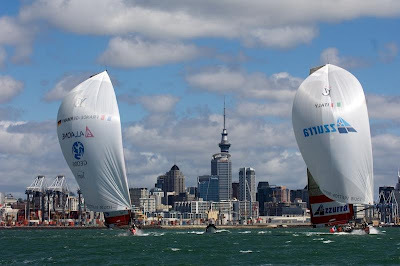 The teams competing in the Louis Vuitton Trophy Auckland will take turns racing the two 2007-generation America’s Cup boats NZL 84 and NZL 92 in four matches a day to complete a round robin seeding series before a ladder elimination culminating in the finals on Sunday, 21st March. LVT: Second Win for ALL4ONE in Louis Vuitton Trophy Auckland! 20 knots of wind today in Auckland, and still beautiful sun over the race course: ideal conditions are gathered for the eight teams taking part to the Louis Vuitton Trophy Auckland, and they offer a top level competition and really tight regattas for the great pleasure of the crews and the public. Any team can win, and every match of the Round Robin is important for the next steps of the competition. And what a 3rd match for ALL4ONE today against Azzurra! Great tactics, great manoeuvres from the French-German team, which remained very close on the first leg without giving anything away straight from the start. They finally managed to take over the advantage in the match when approaching the first mark upwind, that they rounded 11 seconds ahead. ALL4ONE continued to increase their lead to end up 46 seconds ahead on the finish line. After its first point scored on the first day against the other Italian team Mascalzone Latino, ALL4ONE confirmed its potential, with a team in good shape, very concentrated and 100% focused on the competition. John Cutler, Tactician: "I think the key in this match was good crew work, good boat control, even when things were not going our way, everyone kept it together. We turned a difficult situation into the start to being close enough to put pressure on Azzurra up on the first leg. Good tacking, really good grinding, good driving by Sebastien Col: we just kept coming back at them, and at the end we managed to squeeze them out at the top mark, which was really good for us. We then kept control of the race, even if they were putting pressure on us. "The Team is very motivated, as it is tough: we've been practicing in light conditions, waiting for the breeze. Then today we had to go straight into 15 to 23 knots of wind. It's a struggle to react, and we know it is going to be windy the next few days. So I think everybody is like "yep, we know how to sail when it's windy. We look forward to racing tomorrow and hopefully get another point." One day at a time!" ALL4ONE will race against John Cutler's compatriots tomorrow for its 4th match in the Round Robin, that is to say Emirates Team New Zealand. Emirates Team New Zealand has won its third straight race in the Louis Vuitton Trophy Auckland regatta. The match against TEAMORIGIN was as good as over when the yachts rounded the first leeward mark. Origin led into the mark with Dean Barker closing right in and applying enormous pressure on the British team. Things started to go wrong for Origin as they began to drop the gennaker. The spinnaker pole went sideways across the deck and the crew was unable to either drop the gennaker or hoist the jib. Emirates Team New Zealand’s crew worked flawlessly in the fresher conditions, dropping the genneker, hoisting the jib and taking off up the second beat as the Origin crew was working feverishly to sort out the problem. 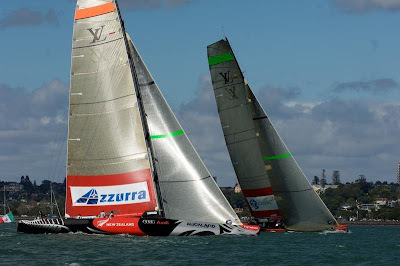 Origin was forced to retire, handing the match to Emirates Team New Zealand. The race was sailed in 14-18 knot breeze. Tactician Ray Davies sums up the race: “A match against TEAMORIGIN was always going to be a battle. We have sailed against them a lot – and it’s never easy. “It was hard to have a clean, clear start plan because the wind was shifting so much. We were compromised at the pin when the wind went further left than expected and we were a bit slow at the start. "'Origin tacked away on the start line, sailing straight into a right hand shift and started to make some good gains. We had to stay in touch and wait for the opportunity." That came as the yachts neared the top mark. Ray Davies: “The wind because shifty and very tricky, but good for us. We gained a lot of ground. And were only 14sec behind as we rounded the mark and gybed. Friday's weather: fresh south-westerlies may affect racing. 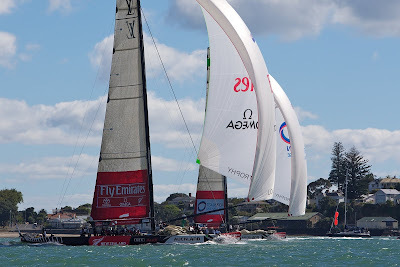 Hotly tipped to be the race to watch of the Round Robin phase of the Louis Vuitton Trophy in Auckland – Ainslie v Barker; TEAMORIGIN v Emirates Team New Zealand, all eyes were on the Waitemata Harbour. With streaming sunshine, visibility clear as a bell, wind direction 235, wind speed 15/16 knots, the talk was of a building breeze so the aim was to get all four flights done by 15:00. The warning signal went at 10:20 for the TEAMORIGIN vs ETNZ start. Both teams started circling in the start box almost immediately, with both talking of wanting the pin end of the line. ETNZ crossed the line slightly ahead but with TEAMORIGIN able to tack off and claim the right hand favoured side of the beat. TEAMORIGIN leads Emirates Team New Zealand downwind. Image copyright Ian Roman/TEAMORIGIN. TEAMORIGIN quickly went bow forward in good pressure on the right of the pair and at the first cross the advantage was to the British team. Both teams tacked off to their respective sides again with TEAMORIGIN maintaining control of the right. 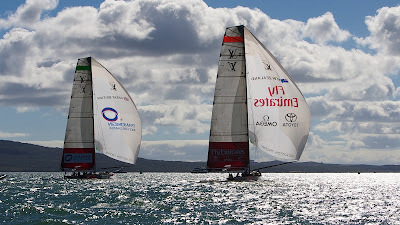 The second time the pair converged TEAMORIGIN’s advantage had grown allowing Ainslie and co. to extend, consolidate and keep control. Approaching the windward mark TEAMORIGIN was forced to tack twice to get around wheras the New Zealanders had found a better layline and managed to gain back quite a bit of distance to round just 14 seconds behind. The pressure was back on and downwind, a wind shift meant both boats stayed on the same gybe until the bottom third of the run, ETNZ hustling to cast a wind shadow on the Brits but not quite managing to get close enough. As the pair approached the bottom gate, the pressure mounted on board TEAMORIGIN with ETNZ breathing right down their necks. A sudden but significant wind shift caused the afterguard of TEAMORIGIN to change the call on the spinnaker drop manoeuvre leaving not enough time for the foredeck crew to respond. Pressure on at the bottom mark resulted in gear damage forcing TEAMORIGIN to retire. Image copyright Ian Roman/TEAMORIGIN. In a few moments of drama, the change of gybe call caused the spinnaker pole on TEAMORIGIN to drop into the water and break – impeding the headsail from being hoisted and the spinnaker from being dropped. A huge calamity for the British team forcing them to retire from the race altogether leaving the Kiwis to sail away and gain a ‘come from behind’ victory – their third win of this series. TEAMORIGIN and Emirates Team New Zealand enjoyed a very close match on Day 3 until a last minute maneouvre and gear failure, including a broken spinnaker pole, put TEAMORIGIN out of the match. Image copyright Ian Roman/TEAMORIGIN. After three days of competition, Emirates Team New Zealand representing the host Royal New Zealand Yacht Squadron is undefeated with three wins while three teams each have a 2-1 record. They are the German/French team All4One, the Swedish team Artemis and Azzurra from Italy. Racing moved closer to the city front today as the southwester funneled down the harbour, with puffs into the low 20-knot range as the day wore on. The weather mark was between the container wharves and the Devonport Dockyard. Tipped as the highlight match of the day, the opening race between Emirates and Britain’s TEAMORIGIN came to a sudden end at the first leeward gate as a late tactical call on the British boat escalated into a firedrill that left spinnaker and jib draped over the foredeck and a broken spinnaker pole over the side. Ben Ainslie at TEAMORIGIN’s wheel led at the end of the first beat after a fierce nine-tack duel up the short 1.2-mile weather leg in a puffy and shifty 13-16 knot southwesterly breeze. 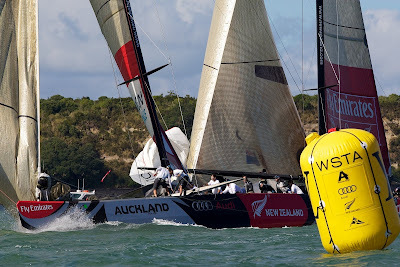 ETNZ was right on the British boat’s heels, just 14 seconds astern and began slowly clawing back the distance. 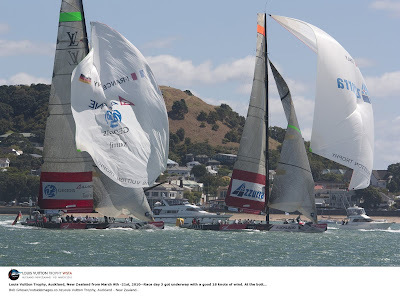 They came into the leeward mark with the Kiwis bow to stern with TEAMORIGIN and British hopes evaporated as Ainslie issued new last-minute orders. “It was a bit of mess,” Ainslie said. “Things change very quickly at the bottom, but a big shift made us change the call and there wasn't enough time for the guys to react." Race One: Emirates Team New Zealand def. TEAMORIGIN, Ret. – Ben Ainslie steering Britain’s TEAMORIGIN, fought for the right while ETNZ skipper Dean Barker went for the left. As they hit the start line, the Kiwi boat with a safe leeward forced their opponent away. However, the first beat belonged to Ainslie. Nine fast tacks later at the port layline, TEAMORIGIN enjoyed a three boat-length lead. The top mark margin was 14 seconds before Barker slowly soaked down on his opponent and picked up more ground with smoother sail handling. With ETNZ close astern and the pressure piling on, it all turned to custard on the British boat as they prepared to drop the spinnaker at the leeward gate. Azzurra and ALL4ONE at the bottom mark. Image copyright Bob Grieser/outsideimages.co.nz/Louis Vuitton Trophy. Race Two: All4One def. Azzurra, 00:46 – Race umpires had their work cut out with multiple incidents and protests in series of heavy-air skirmishes between Francesco Bruni steering Azzurra and Sébastien Col on the wheel of the German/French All4One. The Italian boat locked out her opponent above the line before the start but Col escaped at the last minute to get back and lead at the gun. Azzurra controlled from the right side but after All4One gained ground in a series of tacks, her tactician John Cutler forced the Italians beyond the starboard layline and above the mark. Col was able to lead back and rounded first in a flurry of protests, all green-flagged. With the wind over 20 knots and the boats pushing white water, they went down the run side by side. Cutler made the call to again take their opponents past the mark. The Italian sail handling suffered under the pressure and Azzurra trailed badly on the last two legs. Race Three: Mascalzone Latino Audi def. ALEPH Sailing Team, 00:55 – Bertrand Pacé’s French ALEPH team used their starboard tack entry to advantage in a pre-start circling duel that took both boats deep into the starting box. The start, with both boats on starboard, was close but Gavin Brady steering ML Audi Team, enjoyed an advantage for a few seconds before ALEPH edged in front. The two boats swapped the lead several times up the first half of the beat until Brady, to weather of his opponent, pushed the French boat out beyond the starboard layline. The Italian boat led into the top mark and consolidated its gains on the next three legs. Synergy bowman in 18 knots of wind on Day 3. Image copyright Bob is Grieser/outsideimages.co.nz/Louis Vuitton Trophy. Race Four: Artemis def. Synergy Russian Sailing Team 00:41 – Skipper Karol Jablonski, steering the Russian boat, engaged Terry Hutchinson at the wheel of Paul Cayard’s Artemis in a lively pre-start duel only to be penalized for gybing too close. The boats hit the line together at speed with Artemis to weather. Seconds later Hutchinson tacked and split away and initiated a tacking duel that took the Swedish boat into the lead. The Russians pushed hard and kept it close around all four legs but finished 41 seconds astern after completing their penalty turn. The Taoiseach, Brian Cowen TD, along with representatives from the Volvo Ocean Race, Failte Ireland and Let's Do It Galway, today welcomed the announcement that Galway has been selected as the finishing port for the 2011-12 Volvo Ocean Race. 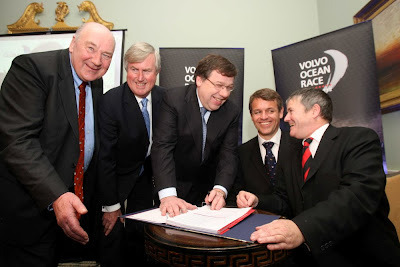 Pictured were John Killeen, President, Lets Do It Global, Redmond O'Donoghue, Chairperson, Failte Ireland, An Taoiseach, Brian Cowen, T.D., Knut Frostad, CEO, Volvo Ocean Race, and Enda O'Coineen, Chairman, Lets Do It Global. Image copyright Jason Clarke Photography. 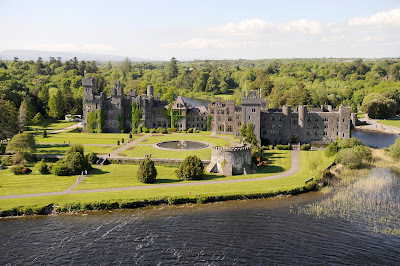 Galway, whose twin town is Lorient, has fought an intense contest against the other bidding ports to win back the event for a second edition and the Volvo Ocean Race 2011-12 will complete its lap around the globe in Ireland’s ‘cultural heart’, where the final prizegiving will be held. “The 2009 stopover in Galway made an abiding impression on the sailors, support crews, organisers and media, who were immersed in the warmth of an Irish welcome. PUMA Ocean Racing, skippered by Ken Read (USA) at the start of leg 8 from Galway to Marstrand in the Volvo Ocean Race 2008-9. 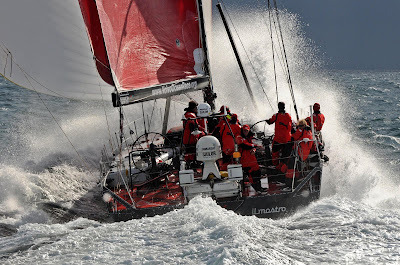 Image copyright Dave Kneale/Volvo Ocean Race. The stopover in Galway during May 2009 fuelled the public imagination as never before. Over 600,000 supporters visited the race village during the stopover, with the crowd peaking at 62,000 people on in-port race day alone. The seaside resort of Salthill drew a further crowd of 120,000 to watch the dramatic close combat race from the shoreline. In-port practice race in Galway Bay 2009: Ericsson (SWE) and Green Dragon (IRE/CHN). 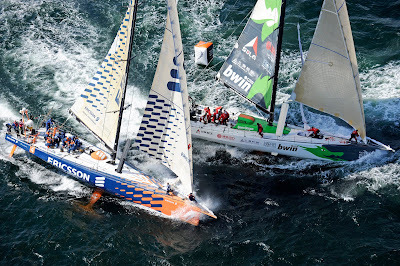 Image copyright Rick Tomlinson/Volvo Ocean Race. Galway’s ‘home town boat’, Green Dragon, became Ireland’s second entry in the race - the first was NCB Ireland in 1989-90. Double Olympic medallist, Ian Walker, guided the team to a fifth place finish overall and claimed the third spot on the podium when the fleet crossed the finish in Galway, delighting the huge crowd that had gathered to welcome them. “The interest in hosting the Volvo Ocean Race, particularly in Europe, has been quite overwhelming,” said Volvo Ocean Race CEO, Knut Frostad, as the last of the European ports was unveiled. “I am very proud to confirm Ireland’s participation and Galway will be a magnificent port to stage the finish of the event. We have already experienced the enthusiasm that abounds in Ireland for the race and we are looking forward to bringing the competition to its conclusion in a country that really knows how to celebrate,” he said. Kylemore Abbey. Image copyright Rick Tomlinson/Volvo Ocean Race. This announcement completes the list of European cities hosting the event. The remaining ports will be introduced throughout March. The Volvo Ocean Race traces its origins back to 1973 and is the world’s premier offshore sailing race. The Volvo Open 70 racing boat is sailed by professional athletes, who race around the world with the prevailing winds. Majan sailing off Cape Town. Image copyright OC Events Asia. With skipper Paul Standbridge, one of the world’s top sailors and the former manager of South Africa’s America’s Cup Team Shosholoza, at the helm, and the start perfectly timed to coincide with the daily firing of the noon day gun from Cape Town’s landmark Signal Hill, the magnificent speed machine, which has utterly captivated Capetonians during her brief stay in the city, quickly built pace of over 23 knots in a brisk 14 knot south westerly breeze and dark rain threatening skies. On the crew is world famous French round the world sailor Sidney Gavignet,crack French America’s Cup sailor Thierry Douillard, former Team Shosholoza sailor Michael Giles from Port Elizabeth, Omani sailor Mohsin Al Busaidi who became the first Arab to sail non-stop around the world last year, Mohammed Al Ghailani a young Omani trainee sailorand Olympic sailor Mark Covell who is the media crew on board. Majan deck. Image copyright OC Events Asia. Earlier the crew of Majan were given a rousing dockside farewell from family, newly made local friends and young sailors from the Izivunguvungu Foundation for Youth in Simonstown who were thrilled to tour the yacht and meet the crew just minutes before they cast off. 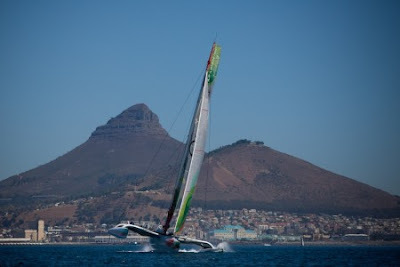 Cape Town is a designated as the first stopover for the race which is planned in 2012. Conceived by OC Events and campaigned by Oman Sail, the Indian Ocean 5 Capes Race will be the first ever yacht race to link the Middle East, Africa, Australia and Asia and the first ever race of its kind in the Indian Ocean. It will feature “city start lines” in Muscat, Cape Town, Fremantle (Australia) and Singapore and five “Cape” finish lines - Cape Ras Al Hadd off Oman, Cape Agulhas, the most southerly point of Africa, Cape Leeuwin on South West Australia, Cape Piai, the southernmost point of Mainland Asia, just west of Singapore and Cape Comorin on the southern tip of India. This next leg to Fremantle which will involve racing across the frozen and treacherous Southern Ocean will be one of the most exhilarating and dangerous of the course, before reaching the warmth of Cape Leeuwin and Australia's west coast. For sailors, the Southern Ocean is the vague term for the Southern Seas and the underworld where no land separates the oceans. Majan sailing off South Africa. Image copyright OC Events Asia. Below 40 degrees of latitude, a series of low pressure systems continuously ‘roar’ and move towards the east without being blocked by any land mass. Down there, the crew of Majanwill find themselves in the Grey World – one of the most remote and dangerous parts of the planet. The A100 trimaran ‘Majan’left Muscat, Oman, last month on 6th February and stopped briefly in the Maldives while en route to Cape Town to traces out this new course via 5 great Capes. She crossed the proposed new race finish line at Cape Agulhas – the second cape on the course - at 16:02:57 GMT, 13 days, 6 hours and 57 seconds after leaving the Maldives. 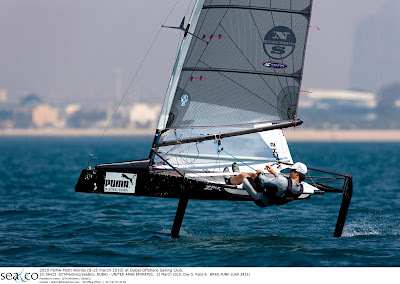 The PUMA Moth Worlds Mach 2 fleet in Dubai. Image copyright Th. Martinez/Sea&Co. Andrew "Amac" McDougall’s nine point lead evaporated today in the difficult patchy Dubai breeze of the third day of the PUMA International Moth World Championship. The first race of the day, race five of the prestigious event, was a carbon copy of the final race yesterday, with US Laser sailor Brad Funk scoring a bullet. European Moth Champ Arnaud Psarofaghis (SUI) scored a second on the same race, and at the end of the day Psarofaghis moved into third place. "Today I lost a few positions I shouldn't have, but overall I was going pretty fast in some difficult conditions," the Swiss racer said. Simon Payne captured third in the race. Brad Funk (USA). Image copyright Th. Martinez/Sea&Co. Seattle, USA skiff sailor Dalton Bergan pulled off the move of the regatta at the exciting start of race six, when he port-tacked the entire fleet – a sailor’s dream at a World Championship. The manuver payed off and guaranteed victory for Bergan. Australian Scott Babbage grabbed second place, with Funk again scoring big with a third. Payne continued his strong performance with a fourth and 2009 World Champ Bora Gulari rounded out the top five. The last race of the day started in a lighter and dying breeze, with Psarofaghis edging out Brad Funk for the race win after Funk broke his boom vang. Funk also lost a sail control called a camber inducer, greatly reducing the power in his rig. The gear failure cost Brad one point, leaving his just two points from race leader Payne, whose consistency has proved his biggest advantage. "I was good but not great today, not quite as fast as yesterday just before I broke my mast, but then the conditions weren't quite the same so you have to take that into account," explained Payne. Thursday is a lay day for the fleet. Andrew McDougall (AUS). Image copyright Th. Martinez/Sea&Co. "We didn't expect this phase of strong winds to be so long! The bad weather with 35-37 knots of breeze was only set to last from 0400 to 1000 hours on Tuesday. In reality it lasted four extra hours and increased to 42 knots with heavy seas... We had two watch systems on deck at the same time for a while because it was impossible to sleep in any case and you couldn't even stand upright down below. We've reduced the sail area to three reefs in the mainsail without a jib up forward! The platform is holding up well but the deck fittings are beginning to suffer from wear. This lunchtime, the wind has really dropped away, to as little as 10-17 knots according to the squalls, with a very changeable breeze. It's been three hours now that we've had a big cumulonimbus on our tail... 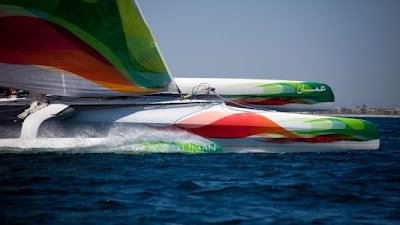 The sea is flat at the moment, the water temperature is 25°C, there's a sticky heat as well as a stifling atmosphere" indicated Loïc Le Mignon at the 1130 UTC radio link-up with Groupama's Race HQ in Paris. "We hope to make it into the tradewinds during the course of Thursday night. However, for the time being, our progress northward is really being hampered. When we head to the left towards the Brazilian coast, the wind heads us as it switches round to the NW and we stumble in a line of squalls. And when we head to the right, the wind veers to the NE as it eases! We're forced to tack on a constant basis to remain in the centre... weaving our way along in line with the breeze. Fortunately, given that Groupama 3 makes such great headway in light winds, we're managing to manoeuvre well. Orange 2 wouldn't have made such good progress in winds like this!" We won't have to wait till the weekend to know the outcome of this "Brazilian ejection": in this region, the wind is either stormy and inconsistent due to a neo-tropical low, otherwise it's steady and on the beam along the northern edge of the Saint Helena High! Heckled by the squalls, the crew of Groupama 3 is scanning the horizon and still stands a good chance of winning on this giant trimaran's first circumnavigation of the globe. However, there's just a week and a half to go to `carry the day'! 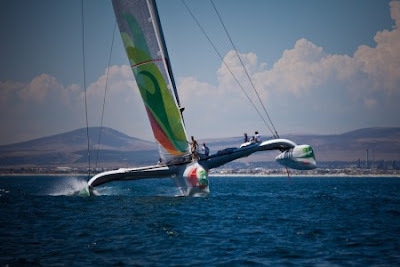 "Groupama 3 is an extraordinary boat! This trimaran can be manoeuvred very easily and we can put in a tack very quickly. The speeds obtained with slightly eased sheets and in the downwind conditions of the Deep South are incredible! Furthermore, after nearly a complete loop of the world, she's in perfect condition, though we're really looking after her... Personally it's a very enriching experience to sail with this French crew: we eat well, there's a very pleasant atmosphere and the average speeds are amazing. Right now it's not proving very easy with the squalls, but we hope to make it through into the tradewinds as quickly as we can. Franck, Sylvain and I are working very well together and the exchanges between us are proving very fruitful. I remain confident about the next stage of this Jules Verne Trophy as the whole crew is extremely motivated to get to the finish within the time limit..." indicated Stan Honey, the American navigator onboard.